Hell yes I want to take my camera on a paddleboard! Thank you Ashley Newman, owner of Union Pilates for taking me on kickass adventures like this - you make me love my job! Ashley is one of my monthly subscribers who does a photo shoot every month so her social media content is always fresh! Click here to learn more about my MONTHLY package. 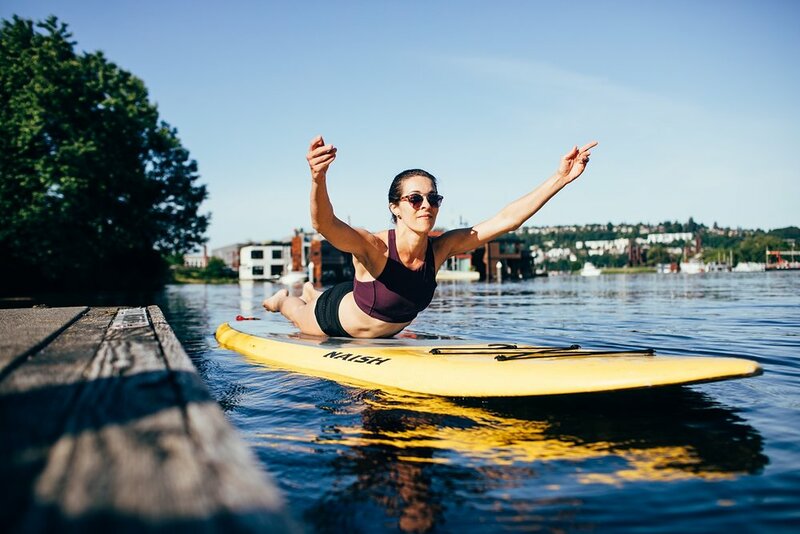 Sometimes we're taking pictures in her pilates studio but now that the Seattle sunshine is out, we'll be snapping photos in nature all season! If you need help healing your body and you want to work with a badass ladyboss, Ashley is your girl. Also, if you're craving more female friends in the business world, seriously reach out to us - Ashley, little ol me and our friends are always excited to add more #kickass ladies to our group! **Most clients want me to add music to their videos but Ashley prefers choosing the music herself, so I just give her the edited (silent) movies, like these ones. She'll add music and post them herself on social media. Interested in doing month shoots with me?